A 40-inch soundbar for just $90? If your budget is tight and you can live with its quirks, TaoTronics offers a very inexpensive solution for improving your TV's sound. TaoTronics’ 40-inch, budget-priced soundbar had the tough job of being my review assignment hot on the heels of Bluesound’s outstanding Pulse Soundbar and Subwoofer combo. Bluesound’s package costs nearly $1,400. You can pick up the TaoTronics for less than $100, including sales tax. Can TaoTronics challenge Bluesound in this space? Not by a long shot. 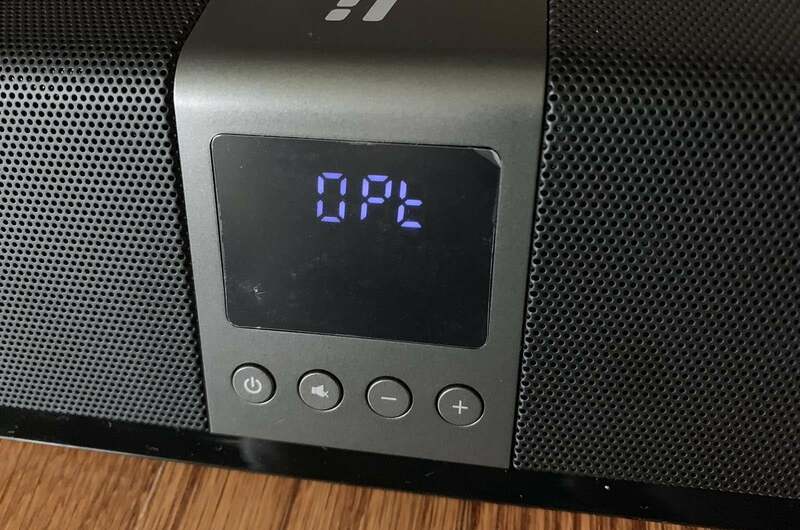 The budget price tag on TaoTronics’s speaker reflects its inexpensive components, limited feature set, and imperfect audio performance. But it succeeds where it needs to: It will undoubtedly sound better than the speakers built into your TV. And if you’re working with a tight budget or you just want better sound for a secondary TV that’s in the kitchen or some other less-critical application, it might be all you need. 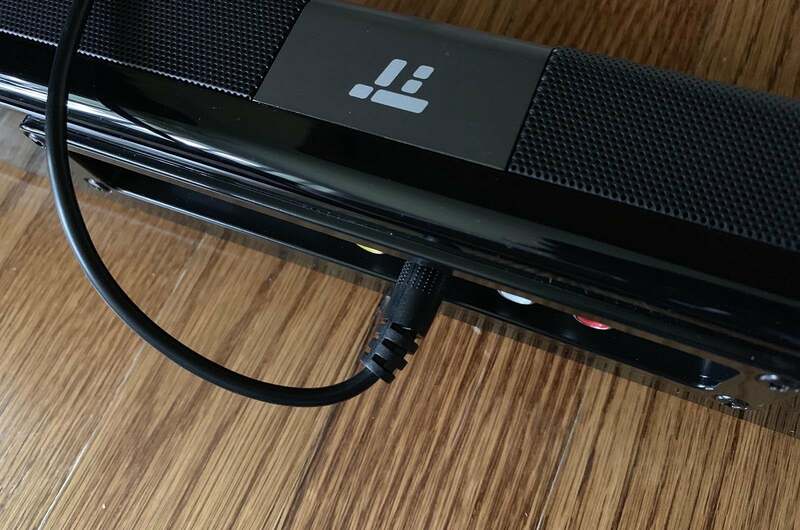 Let’s take a closer look at this soundbar’s hits and misses. 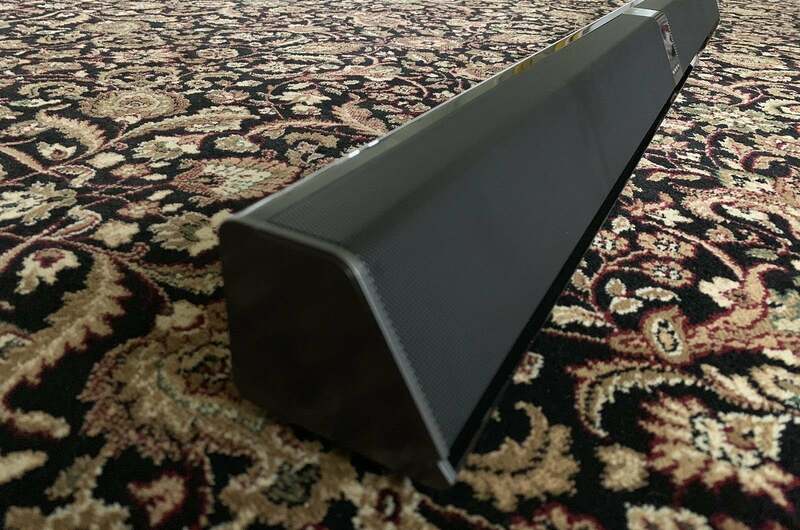 TaoTronics’ soundbar is extremely light for its size, weighing in at about 3.8 pounds. Measuring approximately 40 inches wide, 2.5 inches high, and 3 inches deep, it will complement most 40-inch and larger TVs. The all-plastic fit-n-feel makes it feel, well, cheap. There’s a small display and basic controls in the middle of the angled front grill. It’s a stark departure from the boring, rectangular design of most soundbars out there. The design looks good on a countertop, but odd when wall mounted. You wouldn’t know it by looking at pictures, but the soundbar cannot not sit flush against a wall. The power cord protrudes from the back of the unit, so the manufacturer provides wall-mount spacers to accommodate it. This makes the unit stick out further than its dimensions suggest. The soundbar cannot sit flush against a wall because the power cord sticks out. Mounting the soundbar to the wall is easy enough, thanks to the keyhole mounting slots on its back. TaoTronics provides the screws and hollow-wall anchors you’ll need, but they don’t provide a template to help you mark where you’ll need to put the screws. The display screen can show the active input or volume and… that’s it. The display defaults to showing the active input. Raising or lowering the volume will show the volume level for a few seconds before returning to the active input. I suppose there isn’t much else for the display to do considering the soundbar’s limited feature set. If you have average eyesight, you should have no problem reading the display from six to eight feet away. The display itself isn’t bright, which is a good thing in a dark room—you wouldn’t want it to compete with the TV for your eyes' attention. But if you place below or in front of a TV that can pump out the brightness, like Vizio’s 1,000-nit 4K UHD P-Series TV I used for this evaluation, reading it will be challenging. Input options are Spartan: RCA, Toslink optical, and coax. HDMI is missing in action, so I chose the optical connection since most modern TVs have that. Bluetooth 4.2 is your only option for wireless music streaming from a mobile device or computer, but you won’t find advanced audio codecs such as aptX. TaoTronics puts a budget-quality optical cable in the box, but I didn’t like it at all. It took unusual effort to properly snap the cable into the back of the soundbar. My advice? 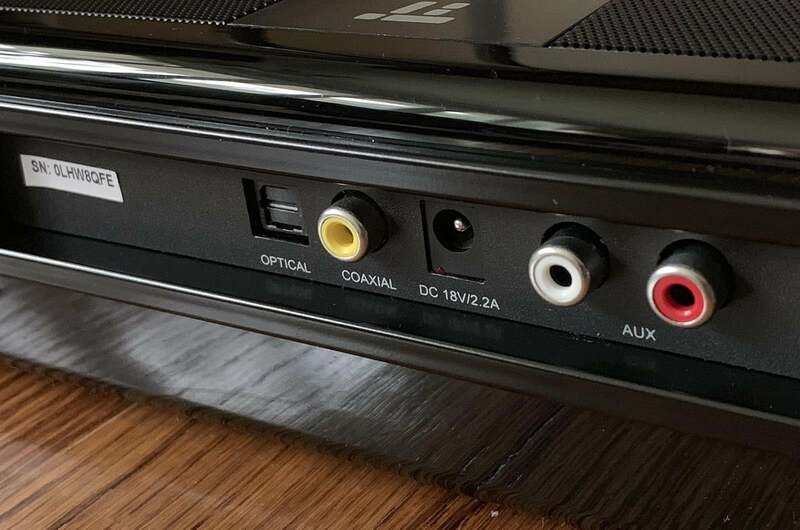 Dump the provided cable and pick up an inexpensive one from Amazon, Monoprice, or Best Buy if you prefer a brick-and-mortar shop. I ended up using an Audioquest Optilink-1 optical cable from my cable stock, which worked far better. I did not use the RCA connection. The included remote is a real remote, not the cheap credit-card style I was expecting at this price point. The remote is aesthetically appealing, with clearly laid out buttons. It’s an inspired knock-off of Apple’s aluminum Apple TV remote. Oddly, there were no batteries included for the remote control. While not a deal-breaker, I can’t remember any recent product I’ve reviewed that didn’t come from the factory with batteries in the box for its remote control. Optical, coax digital, and RCA input options are available. 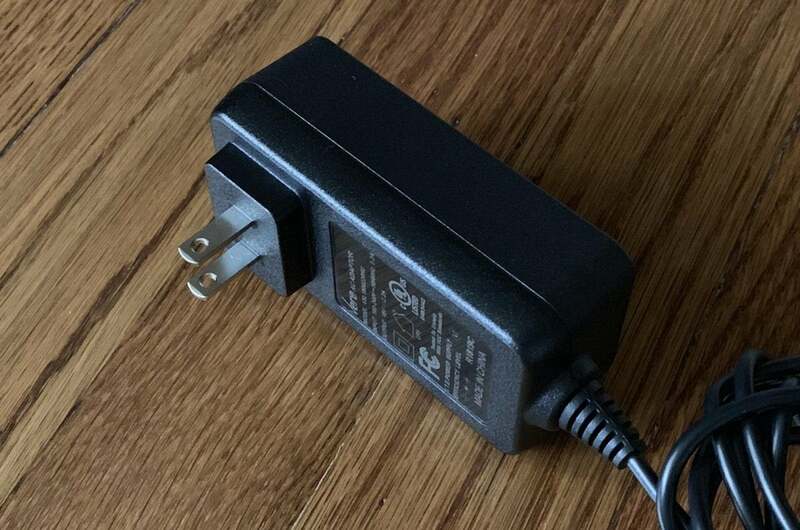 The included five-foot power cord is shorter than what’s been provided for most of the soundbars I’ve tested, and there’s an ungainly wall-wart power supply at the end of it. You’ll need to make sure there’s an outlet close by or you might need an extension cord. I tested the soundbar with three configurations. The first used the built-in Netflix app on a Vizio 65-inch P-Series TV I have in for review. The second was with an Apple TV 4K connected via HDMI to the Vizio and then connected to the soundbar via the Vizio’s optical output. The third configuration was an optical connection from the TaoTronics soundbar to my Oppo UDP-2ddd05 player, which I used to play music from my Roon media server. As I sat down to test this soundbar, I felt as though there were two fundamental questions TaoTronics needed to answer to prove the soundbar’s worth: First, could it improve on the substandard sound that comes from today’s thin 4K UHD TVs? Secondly, could it render dialog clearly and intelligibly. In my testing, it scored well in both departments. Considering this speaker costs less than $100, it really sounds good. 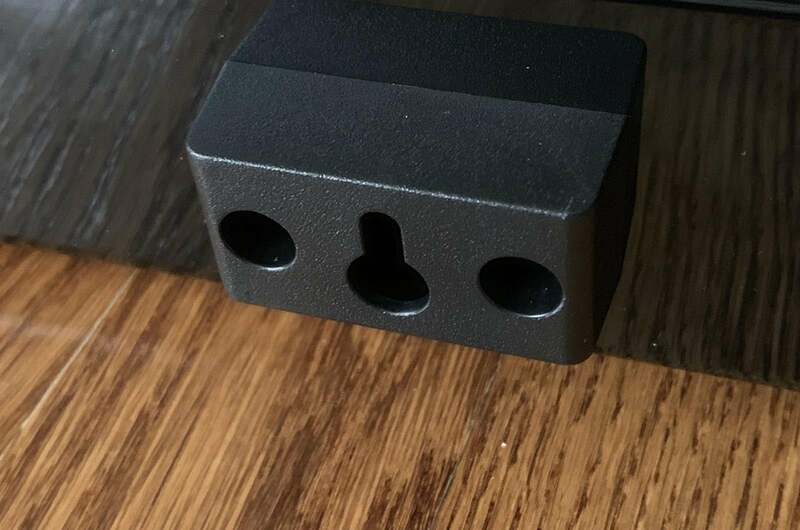 Unlike most of the competition, the TaoTronics comes with a bulky wall wart plug. 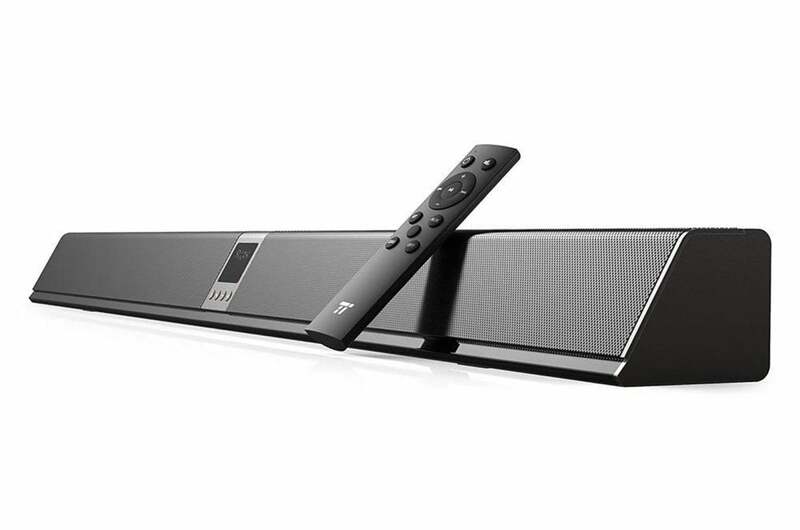 The TaoTronics soundbar was comparatively better than the speakers built into the Vizio’s P-Series. The Vizio’s sonic presentation was thin overall. Comparatively speaking, the TaoTronics filled out the midrange and delivered solid, highly intelligible dialog. I watched some Seinfeld reruns, NHL and NFL games, and checked out a selection of various movie trailers on the Apple TV 4K and everything sounded just fine. Now, to be clear, I don’t think that the TaoTronics will best every TV’s built-in speakers—especially higher-end 4K UHD models, such as the Sony Bravia XBR-A1E. When I jacked up the volume, however, this soundbar became harsh and fatiguing to listen to. Lowering the output helped, but this speaker isn’t a good fit for a large room. Its amplifier and drivers just aren’t up to the task. I’d venture a guess that it will sound fine in 12x12 and smaller rooms. My room is more than twice that size. You can ignore TaoTronics’ marketing claims of “deep bass,” and there’s no option to remedy that shortcoming by adding an aftermarket subwoofer: The speaker lacks an LFE (low-frequency effects) or subwoofer output. If you crave bass response, you’ll need to buy a more upscale speaker. The display shows the currently selected input. It will show you the current volume level when you change volume on the remote. I also ran into two other issues of note: First, the soundbar cannot decode Dolby Digital or any other form of multichannel audio, nor can it down-mix a multichannel signal. Feed the soundbar multichannel audio and it just won’t know what to do with it—you’ll be assaulted by a cacophony of machine-gun-like bursts of noise and distortion. Non-technical users might think the soundbar has malfunctioned. This happened when I tried to play A Wrinkle in Time, which has a 5.1 soundtrack, via the Vizio’s built-in Netflix app. To remedy the situation, I had to select audio and down-mix the signal to stereo. Make sure that any source you feed the TaoTronics soundbar is stereo or multichannel down-mixed to stereo. Your other option is to rely on the analog stereo inputs and avoid sending any digital data to avoid potential incompatibilities. Wall mounting relies on these rear keyhole mounts. The other thing I noticed was excessive hiss from the soundbar’s drivers throughout my testing. It’s more noticeable at close distance and when you’re playing the soundbar at a lower volume than at regular listening levels. This was present regardless of whether I played content through the Vizio, the Apple TV 4K, or directly from the Oppo UDP-205. 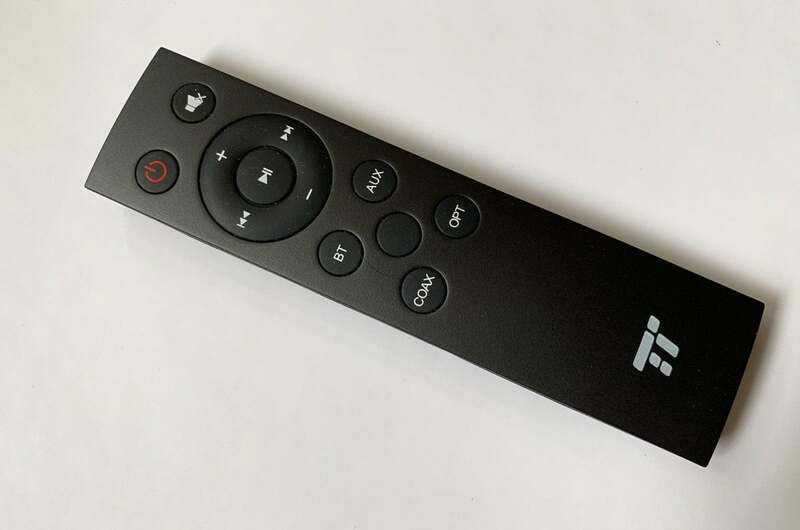 TaoTronics provides a great remote control with its budget-priced soundbar. TaoTronics 40-inch soundbar will noticeably improve on the substandard sound that comes with many modern 4K UHD TVs. Perhaps most importantly, this soundbar renders highly intelligible dialog without any gimmicks. It's far from perfect, but it does provide appealing options with relatively little financial risk. If you’re dissatisfied with your TV’s built-in sound and are on a strict budget, then give this soundbar a look—just don’t expect it to perform any sonic miracles.